This is what makes the blood shot racoon eyes from long hours and lack of sleep so worthwhile! Today I started early at 4am and was lucky to get off early at 8am. I was just in time to jump onboard the last zodiac heading for St Andrew bay which is home to South Georgia’s largest King Penguin population (and yes they are all penguins behind me). It was one of those times where you feel how amazing something is when you’re there. So many times it is not until you have left and reflect that you realise how beautiful a place is or how special the moment was. But it is impossible not to be awestruck by the vast sea of penguins, the fur seals, the sounds, the smell, the curiosity of the clumsy yet elegant king penguin. Add to this the beautiful blue sky day which is very rare and the wonderful backdrop of rocky peaks and glaciers, just added to the moment. I describe St Andrews bay as a penguin refugee camp, you know how you see overcrowded refugee camps on the 6 o’clock news, well that’s what it felt like. 200,000 King penguins packed onto the beach, and add to this South Geogia’s largest Elephant seal population. Just awesome. This afternoon I was hoping to get to do another landing at Gold Harbour on South Georgia Island but it has been cancelled due to high winds, which is probably a blessing in disguise as it meant I could write this post and catch an hours sleep. The photo below is from the observation deck as we are anchored in Gold Harbour. Below is a short video I took looking down on the penguin refugee camp (how many times can I say amazing in one video?). I hope everybody had a jolly ol Christmas. For me it was spent in the Falkland Island, well the 24th was spent in the Falklands and actual Christmas was spent at sea enroute to South Georgia Island where we arrive early tomorrow morning. I was lucky enough that my work breaks fitted in with the landings and was able to get onto the islands. The first landing was at Shetland Island (sorry for spelling) which is home to 140,000 penguins, all kinds, rock hoppers and king emperor penguins etc, and sheep! I felt like I was back at home with the sheep and the rolling grassed hills falling away into the ocean. Another landing was at Stanley, the main town in the Falkland’s. You probably have heard of the Falklands due to the Falklands war in the early 80’s between Argentina and England. Stanley is the only town on the island with a population of about 2000, a slice of England on the coast of South America, the pound is the currency and every second vehicle is a land rover and there are plenty of cake shops. I had an hour and half off the ship, so I had a wander around. Then when all the Filipino crew were heading to the church to make confession, I decided that an hour and half wasn’t long enough for my confession so I made a bee line for the first smoky clapped out English pub I could find. The old pub with the horses and clothes line in the front yard fitted the bill, the cheesy Christmas carols on the local radio was a slice of heaven, an oasis away from the “yes sir, yes madam” world. It was a place I could sit down have a beer and a burger and write a little Christmas blog to you my blog readers. So the above was the 24th, and Christmas day was a memorable one, not the best Christmas I have had as working a isn’t my idea of fun and I’m sure even Santa Claus must get annoyed having to work Christmas. But hey it was a memorable one none the less, in the middle of the ocean living the dream! I was warmly greeted Christmas morning in the crew mess as I inhaled my cornflakes with a jolly “lets go, quick quick, we start work in 2 minutes”. It was like any other day really, except I was saying “merry Christmas madam/sir” and I had to sing Christmas carols! I’m quite enjoying this cruise as we have a good bunch of passengers on board, quite a few Ozzies and even a couple from my home town in New Zealand!. Then after the 13 hours of festive work, the crew let their hair down (can I still say that now that I don’t have long hair? ), there was an open bar and plenty of swaying and dancing on the dance floor. There was even a little strip dance from the Galley boys (pictured below), the Filipino’s definitely know how to have a good time. It’s quite funny trying to dance with the rolling motion of the boat, and then add a couple of beers to that it can get quite interesting. Ok, pictures speak louder than words, so I will let the photos from my landing at Shetland Island do the talking as I’m writing too much and have to be up in 4 hours to start work at 4am.Looks like a .14 hour day tomorrow, I’m living the dream yo! 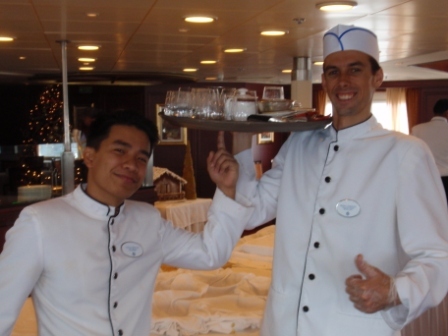 Work on a cruise ship and see the world!…………….ummm NO! This should read, work on a cruise ship and see the inside of a cruise ship! I was excited yesterday, we arrived back in Ushuaia at 6pm, it was great to see the southern most town from the cruise ship, instead of seeing the cruise ships from the southern most town as I had done so for a month before. But let me share my day in port with you, which was literally a day in port. 0300 Get from town, back to cabin, get some quick sleep. 1600 Finished provision loading. Go and get 1 hour sleep before passenger general emergency drill. 1750 I’m writing this blog post quickly before dinner. So as you can see, a day in port for an assistant waiter aboard an Antarctic expedition ship is exactly that, “a day in port”, although usually we are meant to get 1-2 hours off the boat, but today was not that day. But I still really enjoyed the day, I spent it doing the kind of work that I love, real kind of work, working with the crew, lifting boxes of random vegetables, working hard but laughing and listening to the Filipino music as we lifted boxes along our human chain. It felt like a holiday from the high pressure environment of the 6 star dining room and intense kitchen. I had a smile on my face which is pretty easy when your working with the energetic fun Filipinos who I am sure are all born smiling. Every now and then I would get time out on deck as we waited for the next truck to arrive and I would take in the mountains that seemed to take on a new brilliance. At one point I had 20 minutes off and went onto the pier and looked back over the promenade where I use to go stand every day looking out over the pier and the cruise ships that I so desperately wanted to work on. It was a great feeling looking back over that spot, remembering those countless hours I spent there, thinking, drinking mate, pondering, trying to keep positive, thinking of new plans of how I would make it happen. It was a great feeling to have actually made it, I was standing on the pier working for an Antarctic expedition cruise ship, I had wanted that for so long, and now I was doing it. OK, I was going to write more, but run out of time. At sometime in the future I will write a post on everyday life on board, do a little video of my cabin etc, give you a little insight, and I will try and get some posts of the landings I have done on Antarctica. This trip I’m currently on is also taking in Faulkland and South Georgia Islands, so hopefully I my schedule coincides with the landings. OK, gotta fly, HAVE A MERRY XMAS. You’ve already had a verbal bollocking from your boss as you didn’t know where something was. You’re skinny arms that haven’t worked for 11 months are aching from carrying the trays laden with plates and glasses above your shoulder. Now you pick up your next tray of crystal glasses, the dining room is packed, your waiter tells you “be careful”, you’re trying to focus on the “care” part of that word, and not the “ful” (fall) part. You raise the tray to above your shoulder, the sway of the ship engulfs you, then you finally straighten up and look out the window to the 3-4 metre (calm conditions for the Drake) swell and feel as though your extremely drunk or on some illusigenic drug. You take your first tentative steps on the rocky dining room floor towards the narrow obstacle course that leads to the dish washing area. Like a baby learning to walk your steps are clumsy, the clanging of crystal glasses ringing in your ear as the tray rests on your shoulder. Through the ringing of clanging crystal, all the words flood your mind “your on show, be careful, be quick”, it feels like you’re in a bad dream, but then you realise “you’re living your dream”! If you’re interested to read the article the Sunday Star Times published about my goal, click here. OK, will post a little video of my first outing on Antarctica in the next day or two. A big thank you and Merry Christmas! Wow, that’s all I can say, it’s been amazing all the comments and emails I have received from everybody, from so many different people, old neighbourhood friends, strangers, uni mates, fellow travellers and you my blog readers. It really sunk in the other night that I had achieved Antarctica when I finally got some US$ to purchase an internet card and checked my blog. All the comments and messages, it was a really warm fuzzy feeling, THANK YOU all so much for being on my little journey and helping me along the way. There were times when your comments and messages gave me that little bit of motivation, kept me going when I just wanted to say “stuff you Antarctica, just bloody melt”, you all don’t know how much all your supportive comments made, THANK YOU. I always pride myself on replying to emails and comments, but I have had to draw the line, as I get off work at midnight, come back to my coffin sized top bunk bed and think I will quickly check my email and blog. Well 2 hours later I’m still tapping away, with the dreaded beep beep of my alarm clock drawing closer –speaking of which it’s 1.30am. And as I have been doing the landings (going by zodiac boat to land) during the day I have not been sleeping on my work breaks. This is not good for my Panda eyes I’m developing or my pocket as I have to buy $20 internet cards. So please except my apology if I have not replied to your message, I still love you! And if I spend all my time replying, I can’t spend that valuable hour a day writing a blog. So once again, a big thank you to my family who give me nothing but support for my nomadic ways. Mandy my girlfriend who is soooo understanding, for example what girlfriend would support her boyfriend to randomly take off 2 weeks before her 30th birthday probably for 4 months just because he says “I just have to go to Ushuaia and try for Antarctica, it’s now of never”. There are so many more thank you’s I have to do, but it’s bed time. But one last thank you, THANK YOU to you guys, my blog readers, it’s been great sharing this all with you and having you along and riding the ups and downs with you all, WE DID IT! 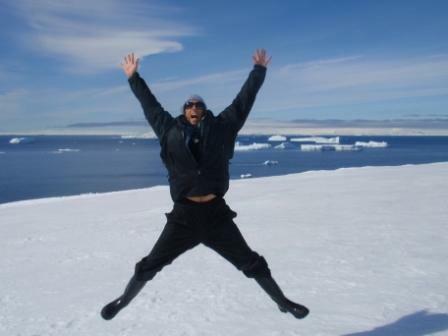 Oh yeah, I nearly forgot, Merry Christmas…………………….from Antarctica! No, I’m not dead; no I haven’t been arrested staying away on an Antarctic bound ship. But I have officially set foot on Antarctica, twice infact! The past four days have been full on, they have the saying, “sink or swim”, well the past four days I have felt as though I have had two 10 kg weights tied to each of my ankles, and I’m flailing my skinny little arms around just barely gasping for air as a I get use to this 6 star service. But more on that in coming posts. So Yep, here’s a couple of photos (and yes I am wearing ladies glasses) from the first landing on Antarctica, was amazing, a desert of whiteness, firstly the beauty hits you, and then just the serenity, the tranquillity, the peacefulness, the silence hits you, I just lay in the snow, reflexed and got consumed by the continent! Anyway folks, I’m off to bed, it’s been full on, up at 5.15am, in bed just after midnight, breaks during the day, but basically life on the ship consists of work and sleep when you can. I apologise in advance for not replying to emails or comments, I have to pay for internet, and even if I didn’t I just don’t have the time at the moment, but big love to you all. Photo below is of Sich that played the vital part in getting me here.